We know you like to keep your professional edge. That's why we provide these technical resources. C++ is taught "the Qt Way". The source documents for our book are in a format that can be used to generate a textbook or instructor's slides. The book includes enough homework assignments and lectures for a 6-credit (full year) course. Its prerequisite is some solid experience in another programming language, such as Python, C, Java, Delphi, or Visual Basic. Are you investing in UX design? You should. Boston UX, ICS' design studio, created this handy, free eBook to show you how investing in user experience (UX) design leads to better products and greater profits. With the rise of the IoT, expanding practical applications for artificial intelligence, and similar disruptions, it’s clear that technological innovation is accelerating. But with innovation comes risk. Minimizing risk in software product development takes insight and best practices gleaned from years on the front lines. In this ebook, ICS Founder and CEO Peter Winston details critical issues you should consider and lays out steps to take to get you across the product development finish line. The Intel® Intelligent Storage Acceleration Library (​​Intel® ISA-L) is an algorithmic library that enables Storage OEMs to obtain better performance from Intel CPUs and reduce developer investment in developing their own optimizations. Intel ISA-L provides tools to maximize storage throughput, security, and resilience, as well as minimize disk space usage. ICS has contributed code development and technical research for several ISA-L whitepapers — learn about the library's set of highly optimized functions for RAID, Erasure Code, CRC, cryptographic hash, encryption, and compression. This whitepaper explores the technology and methodologies used to develop a sophisticated IVI proof-of-concept for Intel. ICS achieved this using Intel’s high-performance hardware and middleware platform, tight integration between Intel and ICS engineers and our internal UX design team within an agile environment. Read how developing a powerful graphical user interface using this stack can provide future forward products for today and tomorrow. 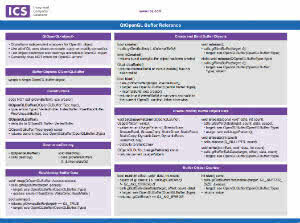 Here is the recently updated QML cheat sheet for the latest Qt 5.9 release. Printable Adobe Acrobat (PDF) versions in US Letter and A4 paper sizes can be downloaded here. The reference does not cover all the QML modules, as the goal was to fit it all on one double-sided page. It does cover the most common QML modules, the basic QML syntax and types, command line options for the QML-related tools and QML environment variables. Here is the Qt OpenGL FrameBuffer Quick Reference. Printable Adobe Acrobat (PDF) versions in US Letter sizes can be downloaded here after completing the form. Here is the Qt OpenGL Buffer Quick Reference. Printable Adobe Acrobat (PDF) versions in US Letter sizes can be downloaded here after completing the form. Here is the recently updated Open Source Media Manager IVI Software Code. Read the press release here. Here is the page with the Open Source Qt-based Clients for Google APIs Software Code.